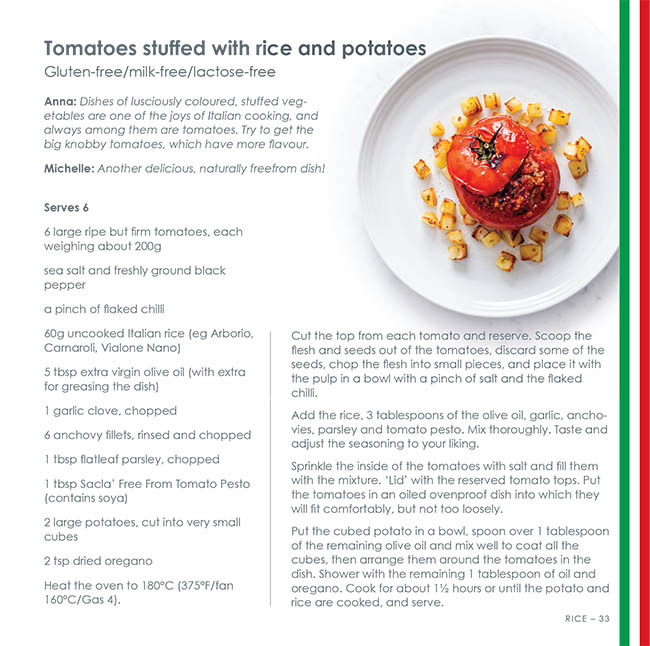 FreeFrom all’Italiana with Anna del Conte – stocking filler!! 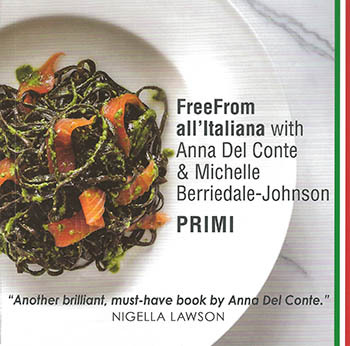 Any of you who know Anna’s wonderful books on Italian food – Gastronomy of Italy, The Classic Food of Northern Italy, Amaretto, Apple Cake and Artichokes and many, many more, will be delighted to hear that she has turned her attention to freefrom. I have to say that it took a good deal of work but when I finally persuaded her to just try some of the new gluten free pasta, she took to them like a duck to water!! In no time she was experimenting with black bean pasta, chick pea pasta, brown rice, quinoa, corn, millet and even seaweed – seen here on the cover of the new book with smoked salmon and Sacla’s excellent dairy free pesto. Sacla, long term enthusiasts of Anna’s work and the leading manufacturer of freefrom Italian sauces, have been hugely supportive. Indeed it was they who arranged the great photography by Ming Tang Evans. And Anna does actually use their products in a few of the recipes – a real compliment from a cook who normally cooks everything from scratch! 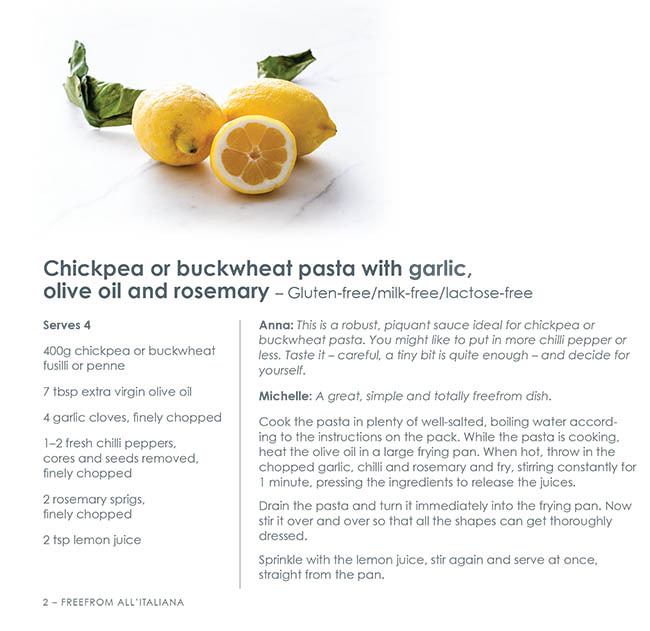 The little book – it is only 30 recipes – is not all about pasta. Nor is it all about gluten. I was anxious that we should include other allergens, especially dairy/cow’s milk. I was also keen that we should recognise that although Brits tend to think of Italian Primi or first courses being all about pasta, actually rice and pulses are as widely used in Italy as is pasta. As far as milk and lactose is concerned, there are just a couple of recipes which are so dependent for their flavour on cow’s milk cheeses such as Gorgonzola that substitution is really not an option. But anywhere else that cheese is used it is either Pecorino, a mature sheep’s milk cheese, or Parmesan, a cow’s milk cheese that, like Pecorino, is very long matured so that (for those concerned about lactose rather than cow’s milk proteins) it is very low lactose. And for those who actually cannot tolerate any milk products at all, even sheep milk or low lactose, every recipe gives suggestions as to how to make it completely dairy/milk free. Then plan is that, if Primi goes well, we will move on to Secondi (Main meat and fish courses), Dolci (desserts) and then possibly vegetarian dishes and maybe even antipasto…..
Excitingly, and very much to our surprise, we actually received the printed books on Friday – just in time to get them out to you for Christmas!!! So we are doing a special Christmas offer on them – ONLY £7.99 each (normally £9.99). If you would like to order one – or several – in time for Christmas either comment on this blog or email me with you name and postal address and how many books you would like. We will email you an invoice and get the books in the post by return. Alternatively you can pre-order it from Amazon to be sent wherever you want – but then they will not arrive until the new year. And….. As if getting the book was not enough….. You can watch a full hour’s BBC 2 programme on Anna and the influence she has had on all of the major foodies of our time – December 22nd, early evening and repeated on Boxing Day at lunch time. Proof – if that were needed – that whatever politicians may cook up, good food is the great unifier!